Commodore has been delivering their PET computer to customers since about September, 1977. For $595 you get a computer with 4K of RAM for user space plus 14K of ROM loaded with BASIC and an operating system. The machine is complete with a keyboard, a cassette recorder, and a nine-inch video monitor. If you pay $795, you get the same machine with 8K of user RAM. All of these are built into a single cabinet, so there are no cables to connect. This means that all you have to do to get the machine up is plug it in and turn it on. BASIC executes in ROM, so you don't use any of your RAM for BASIC, and BASIC is there ready to use immediately. You do lose 1,024 bytes of RAM for scratch pad, the stack. input buffers, etc., but the rest is available for user program, variable, and array space. On balance, the PET is the best machine I've ever seen for the teacher and the student. (This doesn't mean it's perfect, as I will point out.) I feel this way because it is inexpensive. portable (I carry mine all over the U.S, to meetings and demonstrations), reliable, and easy to use. It also has an excellent BASIC. 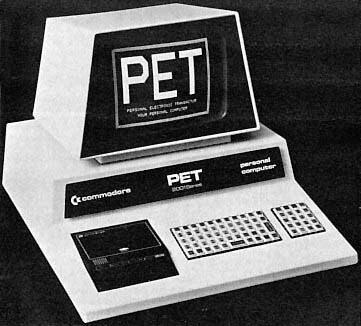 Commodore's PET is one of free very few personal computers that combines all four basic units (keyboard. computer, cassette drive, video output) in a single package. that is, both variables are treated as the variable AC, which is set to 0 by line 20. If the user asks for a LIST, however, the program will be listed exactly as it appears above. This is useful in commenting within a program and should eliminate the REM statements we have had to use in documenting programs in the past. Although the program line may be 80 characters long, the screen displays only 40 characters on a line (with 25 lines displayed). Longer lines overflow to the next line. This is a serious deficiency in the PET. For plotting graphs, or even for text. 64 or 80 characters is far better. The graphics capability is impressive in a machine at this price. There are 64 graphic characters in addition to the normal letters, numbers, and punctuation. Each printable character may be displayed direct (white on black) or reverse (black on white), essentially giving us 128 graphic symbols. These graphic symbols range from thin lines through rectangles, segments of circles, intersecting lines, and bars to the spade, diamond, heart, and club of playing cards. These symbols may be seen in the upper-case positions on the keys in the figure. The PET may be put into a special mode in which the graphic symbols over the alphabetic characters are replaced by the lower-case alphabetic characters. (you forgot the THEN), you can place the cursor on the 2 of 260, insert four spaces, and then enter THEN. After Return, the line is changed. This editing capability means that long lines don't have to be re-typed. The second reason for excitement about cursor control is that the cursor controls may be imbedded in a program. This essentially gives us a two-dimensional TAB function, which together with the graphic symbols permits the display of complex visuals. And because you can blank the screen under program control, you can generate simple computer animations. Not only can we make programs more interesting for the user with graphics, but we can challenge kids to create their own graphics without requiring any knowledge of mathematics (see, for example, the DRAW program published in the November-December 1977 issue of People's Computers). The built-in cassette recorder permits the user to save programs merely by typing SAVE "NAME" where NAME is a real name (not A. B, or Q as in some micros). Re-entering requires only typing LOAD "NAME." The PET also has a VERIFY command which checks to see that the cassette version is identical to the one in memory. If it isn't, the screen displays a verify error. This feature is very valuable and is unavailable on most micros. The user may customize BASIC because PET BASIC has a USR function to permit entry of user-defined machine-language routines. The PET can be interfaced to the real world through any one of four external ports which are accessible through BASIC commands. There is an IEEE 488 interface, an eight-bit parallel port, a port for a second cassette recorder, and a port that brings out the system bus (it's not an S-100 bus). The second cassette recorder permits the user to put together a file management system, although the manual makes the user nervous about making a mistake and wiping out entire files. The keyboard is, perhaps, the machine's most vulnerable component. It looks more like it belongs on a calculator than on a computer. The key-to-key spacing is only two thirds that of a conventional keyboard. which means that touch typing is difficult and even a two-finger duffer like me hits the wrong key now and then. On the plus side, the keyboard includes a number pad and all the common symbols (+, -, *, parentheses, quote mark, etc.) are available without requiring a shift. Since each of the 64 graphics characters can be displayed in white on black or black on white, 128 graphic symbols are available, including the four playing-card symbols. Commodore uses the MOS Technology 6502 (made by one of their subsidiaries), which has a very awkward instruction set. This means that the USR(X) function is more difficult to use than is true for most eight-bit microprocessors. This difficulty is obvious only with the USR function. In program execution. the PET is at least as fast as any other microcomputers which I have tried. There is no composite-video signal available to the user. This means that a teacher who wants to use the computer in his/her classroom cannot display the screen on a monitor. Marc Hertzberg in our lab at Stony Brook has designed a system modification which provides this signal and which costs about $3 worth of parts and may be installed in less than half an hour. There is no handle on the PET. I put on a $1 hardware-store handle and take my PET everywhere. Actually, none of the microcomputer manufacturers has put on a handle. Incidentally. the PET weighs 44 pounds, which is a bit heavy. Twenty pounds is a good weight goal. We have a small number (three or four) of system crashes a month on each of our three PETS. We haven't been able to pinpoint the cause but suspect that line spikes are getting through the power supply. Fortunately. because BASIC is in ROM, we can recover by turning the machine off and then on again. Of course, in the process we lose whatever was in RAM. It would be nice to have a system restart mechanism which doesn't zero the memory. The cassette recorder doesn't have a counter, which is a real nuisance. If you have several programs on one tape, it is impossible to fast-forward to a point near the beginning of the program before loading. This means that you must start at the beginning of the tape and let it run at regular speed until it finds and loads your program. The advertised transfer rate on the cassette recorder is 1000 baud. The effective transfer rate is closer to 250 baud because of overhead in the file format (leader space, redundancy, etc.). This, combined with (4) above, means that you must put only a small number of programs on a cassette or wait perhaps several minutes to get a program loaded. Arthur Leuhrmann of the Lawrence Hall of Science has solved this problem by using C5 cassettes and recording only one program per cassette. Probably the most inexcusable deficiency in the PET is the sad state of the user's manual. When we got our first PET in October, we got a small booklet which told us how to turn the PET on, how to save and load programs, and which merely listed all the BASIC commands. Our second and third PETs arrived in December with a slightly larger booklet. This one gave brief illustrations of most of the commands and a little trouble-shooting information but still was inadequate.-In January, we got about 50 loose-leaf pages describing the BASIC commands in adequate detail. With patience, I suppose that we eventually will get a real manual. Another possible problem with the PET, at least for school administrators, is a lack of approval by Underwriters Laboratories. This doesn't mean that the machine is unsafe, but it is a base which Commodore should touch as soon as possible. Additional memory is expensive. At a time when good 16K RAM boards sell for less than $400, charging $200 for 4K of RAM is hard to take. Additional RAM, beyond 8K, must be placed outside the main cabinet, which is a bit of a nuisance. This extra RAM isn't available yet, and no costs have been quoted. The fact that the PET bus is not S-100 means that all the great boards (speech, music, Dazzler, A/D, etc.) cannot be used on the PET, All is not lost, however. At least two companies already offer S-100 adapters for the PET.